It had started off with the energy that comes from realizing how to lose 10 pounds in a month. Bill Pollackov had just run the equivalent of a half-marathon in 7.5 hours. It was cause for celebration, as this was more than a simple run: It was the New Jersey Beast, a 13-mile Spartan Race with thousands of feet of climbing and countless, gut-checking obstacles. It was a pivotal moment—the one where knew the weight wasn’t coming back. Just two years ago, Pollackov couldn’t even run a mile. He was 42 years old and 465 pounds. His father was heavy; he died at age 59, and when Pollackov was cleaning out his dad’s closet, he found a pair of 64-inch waistband pants. The Jacksonville, Florida, father of two thought to himself, “I’ll never get this big.” Then he went to buy new shorts—he couldn’t fit 58s, so he bought a pair of 60s. It was September 2014 when Pollackov’s buddies sat him down for an intervention. “It was like this stunning, glaring realization that I’m turning into my father,” he says. “And I was only 43 years old—it was kind of my ‘a ha’ moment.” Then, Pollackov met Dr. Arun Rao, a Clearwater, Florida-based surgeon who changed his life by laying out a seemingly impossible set of goals. “I see you at 215 to 220 pounds,” Dr. Rao told him. That meant he’d have to cut his body weight by more than 50 percent. The question of how to lose 10 pounds in a month became central. The doctor told him that in 2016, he’d run the 15K Gate River Run in Jacksonville, and after that he’d prepare for Spartan. “I want to see you do an obstacle race ,” she said. New to Spartan Race? Find the right event for your personal transformation. How to Lose 10 Pounds in a Month. Or More. With a physician-monitored diet program, Pollackov started shedding pounds. (The simple act of cutting two gallons of diet soda from his diet each week helped substantially.) He joined a gym, Trinity Fitness, where he met Jim Elliot, a friend-in-the-making who would help push him and keep him from giving up during difficult metabolic conditioning and bodyweight exercises. In time, the fat began evaporating at a rate of 10 to 15 pounds each month. 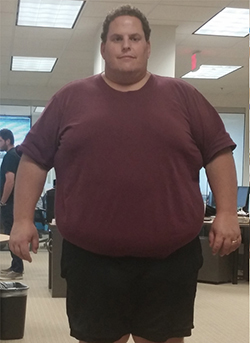 By the end of 2015, he was down to 300 pounds. In March 2016, he ran the 15K Gate River Run, just as Dr. Rao had prescribed. He also ran a handful of 5Ks, 10Ks, and a Thanksgiving half-marathon. He was ready for his first Spartan Race. Pollackov ran the middle-distance Spartan Super in Bunnell, Florida, in December 2016 with 60 friends from his gym, and the moment he crossed the finish line, he vowed to complete the Trifecta in 2017. Since then, he’s run the Atlanta Sprint, the San Jose Super, and the New Jersey Beast—a 13.8-mile sufferfest over innumerable hills. “Crossing the finish line with literally nothing left to give was the best feeling I have ever experienced, outside of my salvation in Jesus Christ, marrying my wife, and the birth of my children,” he says. Today, the 60-inch waist shorts are long gone. At 225 pounds, Pollackov weighs less than he’s lost, and an excess-skin-removal surgery will take him down to 215. He hasn’t been that light since 7th grade, but more importantly, he’s gained a mental clarity that he says makes him better at work and more present at home with his family, who he brings along on Spartan adventures. You might not have 245 pounds to lose, but that doesn’t mean you’re not still fighting your own fitness battle. Here, Bill Pollackov shares the three lessons he’s learned about dropping pounds.